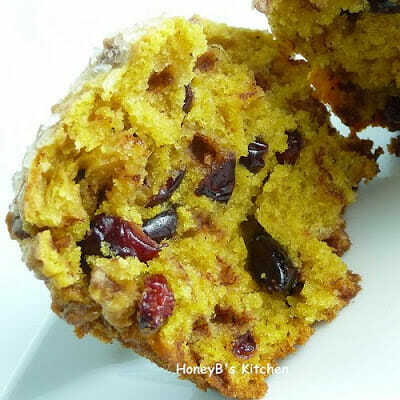 The other evening as I was visiting blogs I came across a post from Pam of For the Love of Cooking for pumpkin muffins. Her recipe was inspired by Maria of Two Peas in Their Pod. I immediately bookmarked the recipe knowing I wanted to make something similar. 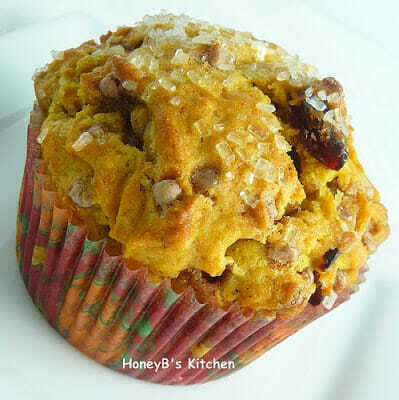 Yesterday, when I got up at my normal 5 AM-and yes, I know some of you know I am awake sooner at times, but normal is 5 :o) – I decided to make a pumpkin muffin myself. There is something special about pumpkin. I don’t know what it is so I can’t tell you what. However, I can tell you that pumpkin pie is Justin’s favorite pie and that Christopher loves pumpkin cheesecake. Grumpy loves both and I love everything pumpkin! I have never forgotten the Pumpkin Cheesecake with Maple Praline topping that my former mother-in-law made one year for Thanksgiving. Actually, I am going to try to replicate that recipe this year! I had a pumpkin muffin recipe I had marked in a Fall Baking magazine I bought last year (from Betty Crocker) so I went to this recipe to make this morning. I followed suit with Pam & Maria and used cinnamon chips (went with mini) and didn’t put chopped pecans that the recipe called for in. The muffins smelled heavenly and I was not disappointed in the least when I broke into the muffin. It was awesome! I’m definitely keeping this recipe around for my future use! Preheat oven to 400 degrees. Spray muffin tin with cooking spray or line with paper liners. In large bowl mix dry ingredients (flour through salt). Toss in cranberries and cinnamon chips. In another bowl mix pumpkin, oil and eggs. Mix dry ingredients into wet until just moistened. Divide batter into 12 muffin cups. Bake for 20-25 minutes (I had to go the full 25 minutes). The Pumpkin Parline Cheesecake is fantastic. I have a recipe if you need one…plus let's not forget these muffins!!!!! I'm not sick of pumpkin either! This recipe looks fantastic, Shelby!! Pumpkin muffins are fun! Yes, pumpkin is still on my list too for preparations. I'm not sick of pumpkin either. Made pumpkin cc bread yesterday. Will try this recipe on the weekend! I'm loving the combination of the pumpkin and dried cranberries. This is a very pretty looking muffin! I just made these and they are delicious and my house smells wonderful too. Added bonus! Thanks for a great recipe! oh gosh I am not sick of pumpkin! those pumpkin muffins look so good,I imagine how nice your house must have smelled while they were baking. Looks good but I want that pumpkin cheesecake with maple praline! Pretty please?! oh how i love these muffins! they look to die for! Pumpkin muffins are always one of my treats to eat anytime Shelby! I could never get sick of pumpkin…these look amazing. I love the addition of dried cranberries. I love all the pumpkin and squash recipes this time of year–I love it all the time actually. 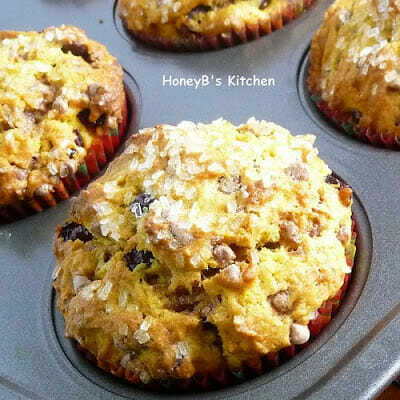 Your muffins look moist and delish, HoneyB! I think I could eat pumpkin all year round! I'm never tired of it. These muffins look delicious beyond belief. Oh my goodness! These look amazing. I love all of the goodies inside. I never get sick of pumpkin! I'm not sick of pumpkin either, grins. Cinnamon Chips? I must look for these morsels of delight! These look delicious (wish I had one right now!). I am LOVING the addition of cinnamon chips! Thanks for getting me off my behind and motivating me to finally get my muffin post up! Those are great looking muffins! Honeybunch, this is just stunning! Love the photos so much. And very seasonal recipe with all the pumpkins popping up at the market!